Experience Mykonos in this spectacularly elegant and modern waterfront villa, built with an impeccable attention to style, luxury and sophistication. Located on 10 acres of Myconian hillside, this secluded villa is just 300 meters away from the private, sandy Kapari beach and just 5 km. from cosmopolitan Mykonos Town. As you enter the villa you will encounter a large, open-space layout consisting of the stylish living room, full dining room for 6 persons and fully equipped and modern kitchen (with stove/oven, dishwasher, utensils, toaster, and dishwasher). 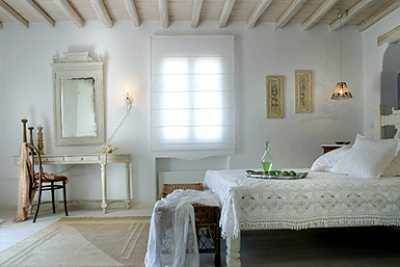 The decor is simple and fresh, with all white color tones, creating a bright yet serene atmosphere. Some decor details include white carved marble floors, white curtains and white upholstered chairs, create harmonious and relaxed vibe. The main house can accommodate up to 6 guests in one master bedroom and two guest bedrooms. The master bedroom, located on the main floor, is built against the rock and features an impressive bare rock wall behind the wooden double bed & whitewash floorboards. Located on the first floor, the two tastefully decorated guest bedrooms offer two twin beds each. Each bedroom has an ensuite bathroom with marble vanities and direct access to a roof veranda, from which you can gaze upon the stunning, unforgettable views of the private pool, the Aegean sea and Delos Island. A recently added garden bedroom with separate entrance offers the same charm as the guest bedrooms, thanks to the antique decor. 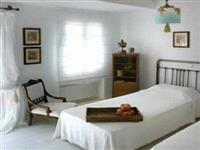 The villa also consists of a studio with twin beds and en-suite bathroom, which is located on the basement level. Enjoy the sea views and forget your troubles while lounging in your private terrace, complete with private salt-water infinity pool and outdoor dining furniture and lounge chairs. While the villa offers the ultimate privacy, it also has close proximity to Mykonos Town should you decide to venture out there. Aside from the private Kapari beach, the next closest beach is Ornos Beach, which is less than 2 km. away; and the local tavernas are just 500 meters away. -Complimentary meet & assist at airport or port with transfer to villa. The island’s main town, Chora or Mykonos Town, is perfect for spending time exploring the narrow, cobble-painted streets enveloped by the famous Cycladic white washed homes and shops. All the houses in Chora are painted white and have brightly coloured shutters and doors in mostly blue, green and red accents making for a lovely and festive atmosphere. The streets, which were designed to confuse pirates in the 16th century, now offer a lovely walk through fashionable boutiques, taverns, and small churches and chapels. Everywhere you turn you can find a promenade to enjoy Mykonos and its never-ending lively atmosphere. The narrow streets close to the harbour area always buzzing with activity. Walk around browsing at the shops as the blooming bougainville trees dot the landscape with their bright, purple hues. All roads in Chora will usually end up at a square with a terraced restaurant and a church, or at the harbor front with its colorful fishing boats, the famous windmills and, of course, the pelicans – the official mascot of the island. 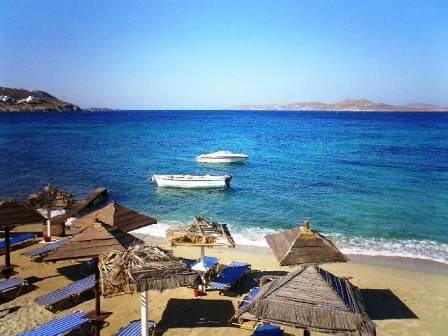 Mykonos has some of the most beautiful sandy beaches in all of the Cyclades that can accommodate your tastes. There are busy beaches, which have the vibe of a daytime club, and there are secluded beaches where you can get away from the crowds. Parage, Elia, Panormos, Agios Stefanos, Psarou, Kalo Livadi, Super Paradise and Ornos are the most popular beaches on the island. 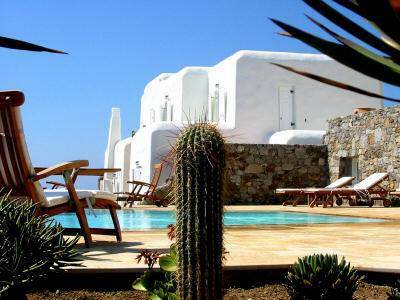 The quiet, seaside town of Agios Ioannis is located on the southwest side of the island and is approximately 5 km away from Mykonos Town (Hora). At Agios Ioannis you will find a peaceful environment, away from the crowds, noise and “party” atmosphere of Hora. The lovely Agios Ioannis beach features soft, warm sand and blue, crystalline waters. It is a great location for families since the beach is organized as well. 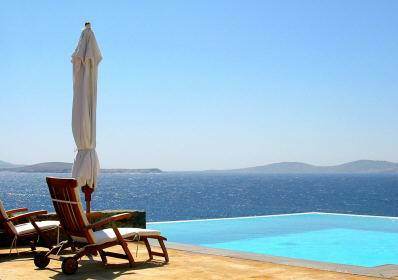 A big draw to the area is the spectacular view of Delos Island. Prices for 2016 are on request.